First of all, a 2 pound bag of chicken feet used to make about a gallon of chicken bone broth is very budget friendly. In some places, it costs less than a pastured chicken. Another reason is that making broth with chicken feet is a failsafe way to get tons of gelatin. Check out the short video in the recipe below of my recent batch of chicken feet broth. Sooooo much gelatin and very little chicken fat to skim off after it is refrigerated to obtain clarified stock which is best for making soup. If you are having trouble getting your bone broth to gel, try making a batch with just chicken feet. You can’t miss! I made a batch the other day and took loads of pictures to show you the simple process. I use a Vita-clay slow cooker to make bone broth and soups whether using chicken feet or not. This is to avoid the potential for leaching nickel from stainless steel as properly made broth uses a bit of apple cider vinegar (only buy brands packed in glass bottles!). 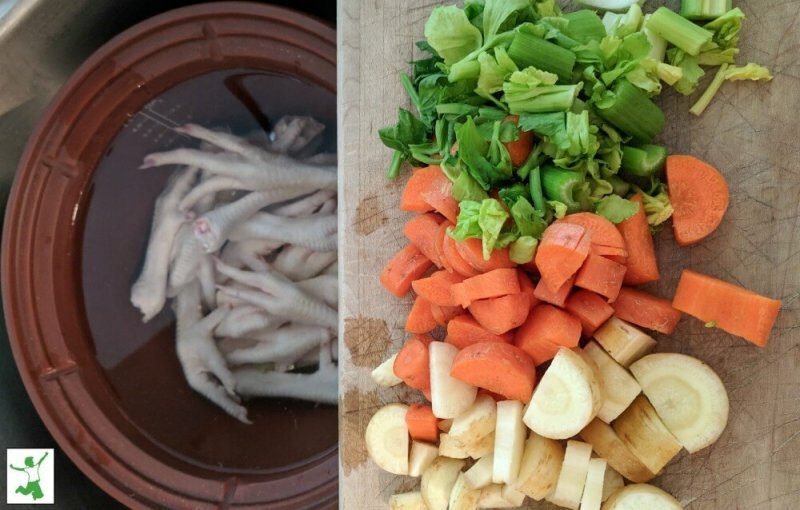 Easy recipe for making broth and soup from chicken feet, which can be more budget friendly than a whole chicken and creates a lot of healthful gelatin and collagen. Place cleaned chicken feet in pot. I use a Vita-Clay slow cooker. Add optional chopped vegetables and stir in apple cider vinegar. Simmer mixture for 9-18 hours. If using a Vita-clay, set it to “slow” for 9.5 hours (this is the max setting for time). If you wish to go longer, you can reset for another 9 hours when it is done. Strain into a glass bowl. Cool on the counter until the broth is slightly warm or room temperature. Pour into mason jar, seal the lid and refrigerate. Rewarm on the stove, add salt and pepper to taste and enjoy on its own or use as a base for all your favorite soup recipes.